Performers threw themselves against the wall, stood nearly motionless practically balanced on their heads for minutes on end, carried each other across the stage and moved deeply and intricately. But the most meaningful takeaway of the Saturday aMID festival show at Links Hall was the power and beauty of the older performers. 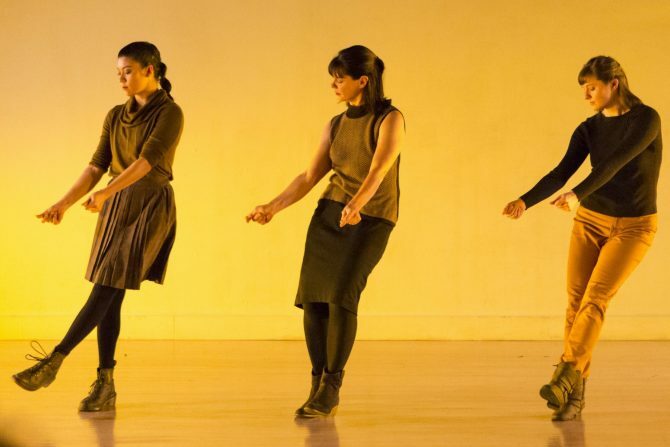 By design, the festival celebrates mid-career—or older—choreographers and performers. These dancers moved with as much strength, flexibility and grace as their younger counterparts. What struck me the most was the energy surrounding these older performers. Dancers and performance artists draw deeply on their emotions when creating and executing their work. As they get older, they amass more life experiences, and, whether good or bad, these provide a richer reserve of emotion to pull from. I’ve always found that older dancers move with more conviction, their performance more believable. Their work is informed with greater sensibility. This was on full display during aMID festival. Throughout the four pieces showcased Saturday night, the strength, poise and conviction of the dancers overpowered any limitations an aging body has placed on them. aMID festival featured a mix of performance art and dance. The show opened with Smith Wynmore Disappearing Act’s Zero Return, in which performers improvised to the commands of a computerized system. Commands began by asking the performers to repeat activities or leave and join the stage and quickly unraveled to a state of the absurd, with the computerized voice demanding performers spank each other, tackle other performers and so on. Some followed these commands without question, others with slight hesitation, but all to great comedic effect. The rest of the evening continued to highlight the virtuosity of older performers, whether through the conviction in Michelle Kranicke’s face during Study #1—The Body in Relation to Object, the grace and exactitude of movement by Pranita Jain in What the Body Remembers or the ease and fluidity that comes with years of collaboration for Bebe Miller and Darrell Jones in Duet With Piece of String.